Transactional – Page 2 – All about SQL Replication…. Understanding conflict resolution is important in peer-to-peer if you intend to enable it. There is an argument that you should enable conflict detection and not the resolution. Knowing that a conflict has happened allows you to investigate and then to initialize one of the nodes after plugging the hole in the application logic. Even so, some people have conflict resolution enabled. It certainly helps with update-update conflicts (provided you assign the OriginatorIDs correctly – see related post on this site). For insert-insert conflicts you’d expect a failure which can’t be resolved. That’s what used to happen. Consider a simple table tRegion. We have a PK on the RegionID column and one site inserts “Rome” and the other node “Paris”. Both have a RegionID value of 2 so there will be a conflict when we synchronize. The nodes are defined as below – the publisher has an OriginatorID of 100 and the subscriber a value of 1 so the publisher will win any conflicts. The crucial bit is that “The incoming insert was applied to peer 1”!!! In other words we now have data in sync and both regions are “Rome”. How is this possible? Well the magic is in the insert stored procedure -“sp_MSins_dbotRegion1335813640” in this case. It will convert the insert into an update for the lower OriginatorID where there is an insert-insert conflict :). Note that this could have unintended consequences! Foreign key records continue to point at this PK record. We could have eg the case that all the Paris streets added at the subscriber now belong to the Rome region. So – be very careful if you are going to use conflict resolution! there is a lack of transparency. Which peers have which ranges? Where is it all being managed from – a spreadsheet somewhere? Setting up new peers always involves manually reseeding the range. The PK could be composed of 2 columns: the identity column and additionally a LocationID column. This means that the identity column is allowed to have overlapping values from different peers and there is no manual reseeding required – the default seed and increment of (1,1) is fine. The combination of the Identity column and the LocationID is always unique across peers, because each peer has a different LocationID. The added benefit is that the record is immediately identifiable in terms of the originator as we simply refer to the value of the LocationID. The PK_ID is the persisted computed column and is set as the primary key. Now we have a narrow primary key and also a guarantee of uniqueness across peers. To be honest I haven’t used persisted computed columns much and at first I thought that it wouldn’t work because the replication-generated insert stored procedure wouldn’t cater for the automatically-computed PK value, or that the updates to LocationID would be “confused” on synchronization with the PK itself having changed. Anyway, I tested it and it all works fine. The persisted column formula was simply the LocationID + Identity – with a large LocationID as a seed to ensure no overlap. Conceptually this is very similar to (1) with the LocationID performing a similar function to the seed of the DBCC CHECKIDENT. However IMO it is far more preferable as it is completely transparent. If you chose to implement this solution you’ll just need to allocate a different default LocationID to each peer and ensure they don’t overlap. This can be done via an additional mapping table maintained in the publication which maps HostName to LocationID, and using a scalar function as the default for the LocationID column which performs the lookup. This means that a backup from one server can be used as a starting point for another peer with no intervention at all assuming the mapping table is already populated. How fast is my Transactional replication throughout the day? If you want to test the speed of your Transactional replication there is a neat functionality called Tracer Tokens. This will tell you how quick is it to get a record from the publisher to the distributor and from there to the subscriber. In the old days you’d have to create a dummy table to do all this but since SQL 2005 it’s out of the box :). Basically, a token is written to the transaction log of the publisher. This is treated as a normal replicated command, and passes from the transaction log to the distribution database and then is ‘run’ by the distribution agent. You’ll see the various latency times recorded for each subscription. If you have a distribution agent set to work on a schedule (i.e. not running continuously) you’ll see the following sort of scenario until the distribution agent runs. where -2147483641 is the ID of the tracer token. This way you can create a custom alert so the support team know when there is an issue. There are SQL Agent alerts based on the Log Reader Agent and Distribution Agents which can be configured, but the method above is a little more under our control and can be used for reporting purposes. This way you can add a Tracer Token every 10 minutes and plot performance over the course of a day. Author AdminPosted on January 19, 2017 January 23, 2017 Categories TransactionalLeave a comment on How fast is my Transactional replication throughout the day? “Keep existing table unchanged” – why would I ever want to use this? There is an option on the article properties to “keep existing object unchanged”. This seems a little odd at first. Surely we always drop all subscriber objects when we reinitialize? Well for a particular table we could have something different in mind. A real edge case but there is a scenario this is designed for. It is where we have multiple publishers to a single subscriber. The table is created on the subscriber by the first publisher during initialization and hence has the replication objects are created at the subscriber. Subsequent publishers will send their commands and records there but leave the table in place. This can be used for centralised reporting from several municipal offices to head office. Any ddl changes such as adding a column are fine – we do them on the first publisher (the one which did the initial drop and recreate at the subscriber) so the ddl change goes to the subscriber. Author AdminPosted on January 17, 2017 January 23, 2017 Categories TransactionalLeave a comment on “Keep existing table unchanged” – why would I ever want to use this? Adding an article – do I really want a complete snapshot? Have you ever noticed that when you add an article to a transactional publication and run the snapshot agent it does a complete snapshot of all tables? This can be a real pain for big publications. Fear not – it is configurable. The setting is visible in the Replication Monitor. Actually 2 settings – shown below. We need both to be False but the observant DBA will notice that the main one of these is greyed out! A little scripting solves it though. We just run the script below before adding a table and all is well – the snapshot agent then just creates the new article. Author AdminPosted on January 17, 2017 January 23, 2017 Categories Transactional4 Comments on Adding an article – do I really want a complete snapshot? 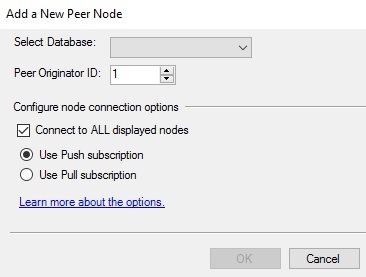 Peer-to-Peer Update Conflicts – Be careful with the OriginatorID!!! In Peer-to-Peer Transactional Replication we can allow for conflict detection and also to continue after a conflict. Really changes to the data at different nodes should be partitioned so conflicts are not possible but not everyone sets it up this way so there is a rudimentary conflict resolution mechanism in place for us to use. For an update-update conflict we’ll see mention of it in the conflict viewer in a format like the one below. One node skips the conflict ie preserves its value, while the other applies the update and so overwrites its value. In the case above, both records end up being “Madrid” and we have data in sync. But how was this decided? The point to notice is the numbers above “peer 100” and “peer 1”. In the conflict, the row that originated at the node with the highest ID wins. The value of 100 is assigned to the Publisher by default, and as above we left the default of 1 at the first subscriber. Now – here’s the point – the publisher in this scenario will always beat the 1st subscriber. The second subscriber always wins against the first, the third always beats the second and so on. This is not something we can change afterwards. So, we need to decide which nodes are the most important before we set this up! Author AdminPosted on November 22, 2016 January 25, 2017 Categories Peer-to-PeerLeave a comment on Peer-to-Peer Update Conflicts – Be careful with the OriginatorID!! !